My name is Janice and I am a coupon cutter. Reading the Sunday paper, drinking my coffee and cutting out the $1 off an item normally $6 – that’s good math. Unfortunately, those little pieces of paper usually go in my glove box and never get used. All that has been completely blown away with the current coupon craze: emails delivered to your in box with huge discounts for local businesses. Think: saving 50 percent at that fabulous new restaurant in the neighborhood. Cutting your hair for 60% off the price at the cool salon downtown. Heck ya! These deals are the latest internet marketing darling and it doesn’t take a genius to know that people love saving money and feeling like they got a “great deal”. And even though there are other coupon models on the web, these new deals have pulled ahead of the pack, combining the best of marketing psychology, financial rewards, and social networking magic. But what makes them special now could be lost in the future. 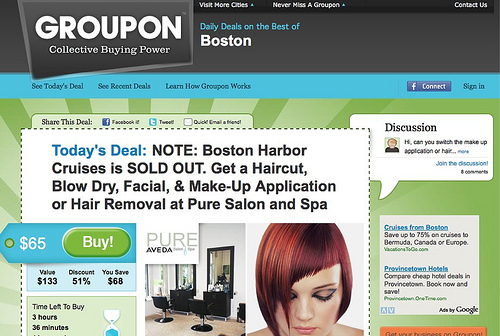 Groupon,the oddly but aptly named service (Group + Coupon – get it?) is the granddaddy of this coupon trend — that is if granddad can be less than 2 years old– and has produced a spawn of copycats, all with their own twist to the online deal. The basic premise of Groupon is that a deal only becomes one if a certain number of people purchase it (as they term “Collective Purchasing Power”). Recipients can forward the deal on to friends via Facebook, Twitter and other social networking tools and are motived by free Groupon bucks and other incentives. If interest falls short of the deal “tipping point”, the offer gets canned and nothing is lost. Given the fact that only 1 of every 7 businesses that apply for the “Deal of the Day” secure that coveted spot and it takes about a month to arrive in an in box, these coupons are clearly desired for many neighborhood businesses. A beauty supply chain in the bay area recently received 4,000 purchases from their Groupon in the first 24 hours. This number is impressive, but when you apply Groupon math it ends up being a big financial commitment by the business: They are on the hook for half of the profits of each deal sold (in this case the deal was $15 for $30 worth of products so Groupon takes $7.50 for each purchase). It also means that the business has to cover that $15 they gave free to each customer. But here is where old fashioned psychology comes in: a person goes to the store, starts looking around and before you know it, has purchased $50 more than the Groupon. And if they are a loyal customer they will come back. If they are a new customer they may or may not visit the store again. But that’s also one of the negatives of Groupon, or any of these deal-makers. There have been cases where a local business offers a deal, gets a huge response, and then has a problem covering the discount, especially when patrons don’t visit them again. Those coupon-buyers just wanted cheap eats for a day, for example. There is a well documented case of a Portland area diner who had to reach into payroll to cover the costs of the “success” of the half off lunch campaign. So businesses should look at the overall health of their finances, who their customers are, and potential of repeat business before going into deep discount land. It will be telling to see which business models succeed in the coupon craze at the market is flooded with me-toos. Many of them have huge sales forces pushing their programs and some have built-in advantages. OpenTable, for instance, has been very successful with its “Spotlight” half-off email deals since their database is full of foodies that go out to eat a lot and have a tendency to be receptive to OpenTable communications. Yelp has a tremendous and diverse marketing base and can reach its audience by interests, locations and other data. They’ve also started deals that extend for an entire week. Both OpenTable and Yelp already have a thriving online presence and brand name so the risk is much lower for their foray in the coupon business. Compare this with LivingSocial, which is a straight up copy of Groupon, down to the witty and pithy prose in the emails. LivingSocial may or may not succeed given they are only selling discounts (their name could use improvement though-maybe they used a Groupon for their naming agency?). And now that the coupon trend is here to stay, Groupon has just recently attempted to add new services to cash in on its astronomical demand and profits. Last week they rolled out Groupon Stores, where merchants can have their own Facebook-like pages to feature deals and consumers can “follow” them. Some online watchers feel that this is a misstep as it will turn Groupon into other coupon pages on the web, requiring consumers to self-serve. What makes Groupon special and successful is that the deals are delivered one-at-a-time to your in box, time-limited, and have ability to pass on the deals to make the price even sweeter. The pump is primed for success of coupons 2.0: They are a great boon to small businesses, offer excellent exposure, and can help jumpstart local neighborhood economies. For consumers it is a win-win since they can try new businesses or get great discounts at a place they already shop. But only some of these online coupon businesses will succeed long-term by keeping the special sauce…well special. Image, courtesy of Groupon (note: Boston Harbor Cruise Groupon is one of the most popular to date. And yes a Groupon can get beyond the tipping point and sell out). Hi, my name is Gretchen and I’m a Groupon groupie. Well, mostly I like to check what the deal of the day is and read the “witty and pithy prose” they come up with for the variety of offers, but I have made a few purchases. It’s an interesting pheno indeed and it would be interesting to study the demographics of their buyers. Glad you referenced Posies Cafe – I read about it a few weeks ago and was amazed at the number of people who left comments on their post. Good job on this blog post!